HomeOffice Plants Tips & IdeasCyclamen, Calla Lily, Kalanchoe- Spring Colour! Need some spring?? Try scattering a few indoor short term flowering plants around your home or office. Cyclamen, Calla Lily, Kalanchoe, Tulip and Daffodil are just a few of the beautiful options. The greenhouses are bursting with colour right now. A trip to Valleyview Gardens in Toronto is a great outing on a dreary February day. If you have office plants, be sure to talk to your interior landscape contractor about adding some colour. Your service provider will make sure the flowers are healthy and pest-free. Don’t risk introducing insects into your office or home plantscape. See our previous blog about how and where to purchase healthy plants. 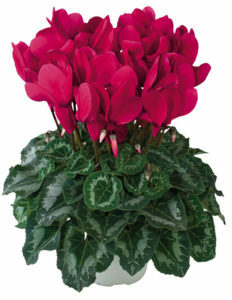 Cyclamen is a flowering perennial native to Mediterranean and North Africa. It is available in white, pale pinks and intense majentas. The foliage is as beautiful as the flowers, with deep green heart shaped leaves, often with white marble markings. This is one of the longest blooming of the potted flowering plants. The flowering will last for weeks, and in the right conditions, new flowers will appear as the old die off. Keep this plant in bright, indirect light. Water from the bottom when the soil starts to feel dry on top. Do not let is stand in water for more than an hour. Kalanchoe is a favourite of interior landscapers. Its flowers can also last for weeks, and it make a great addition to mixed tropical arrangements. Flowers can be red, pink, white, orange or yellow, and it is popular to find pots containing multiple plants of different colours. Kalanchoe flowers can last for weeks, and will often bloom repeatedly over years. Kalanchoe is a member of the same family as Jade Plants. They are considered a succulent, as their fleshy leaves hold considerable water. Water these plants sparingly, only when the top of the soil is quite dry. Dry conditions will encourage flowering. Calla Lilies are another favorite. Although the flowers will not last as long as cyclamen or kalanchoe, their simple elegance makes up for this. It is impossible to list all the colours and varieties of the Calla. New ones are introduced every year, with every shade imaginable. Newer varieties have unique spotted foliage as well. Although called a lily, they are not a true lily and are a member of the magnolia family. 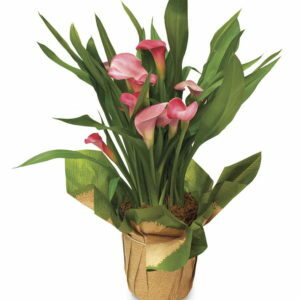 Keep Callas moist at all times, but as with any potted plant, do not overwater as the roots will quickly rot. Calla lilies are perennial bulbs; if you are patient, it is possible to encourage them to flower repeatedly with periods of rest in between. Potted roses, daffodils and tulips are inexpensive room brighteners. Just keep in mind that they will only bloom for a short period of time, usually less than 10 days.